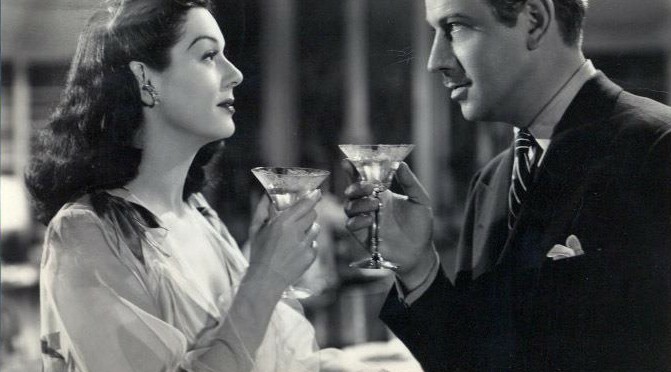 When Rosalind Russell was told she was going to be William Powell’s leading lady in the 1935 film Rendezvous, she automatically felt bad for him. “I felt self-conscious. Powell and Loy had been a hit in The Thin Man, they were an unbeatable team, so my first day on Rendezvous, I tried to apologize. ‘I know you don’t want me, you’d rather have Myrna—‘ Powell denied it. ‘I love Myrna, but I think this is good for you, and I’m glad we’re doing it together.’” (Life is a Banquet, 59). His kindness helped her in more ways than one. It is obvious that they enjoy each other’s company in this film, and Roz does quite well in her first lead role. She adored Bill Powell as a friend and as a man—a man with many great qualities, especially in his ability to make others around him laugh and above all his gentlemanly manners. After eight rather limited, sometimes thankless roles in films, Roz finally got her lucky chance in a lead role and opposite one of the most popular and charming actors of the day, William Powell. It was also the first time she had a significant comedy role (the only other time she delivered comedy lines was in Forsaking All Others, and she had little screen time). She does wonderfully in her first lead comedy role, which foreshadows what a great screen comedienne she would become. Most Rosalind Russell fans are aware of what some of us call the “Roz Eyes,” which occurs when Miss Russell widens her eyes just enough to make the audience laugh, a funny reaction that she displays in many a comedy. She does it so easily that I have begun to suspect she did it involuntarily; it was just a natural reaction in comedy. She also tended to raise her right eyebrow when she thought something in the situation was a bit off or if she didn’t like what her co-star said. These are the little things—the facial expression, eccentric gestures—that become apparent when one carefully studies an actress’s work. It is just these typically Roz facial expressions that first become obvious in Rendezvous. Oh, she might have done it in earlier films, but it wasn’t as noticeable. It is these reactions that can sometimes remind one of Lucille Ball in “I Love Lucy,” another great comedienne. Rendezvous stars William Powell (in large letters above the title, of course) and Rosalind Russell (in much smaller letters below the title, but hey, I suppose she was still getting started). These two had a very fun chemistry. 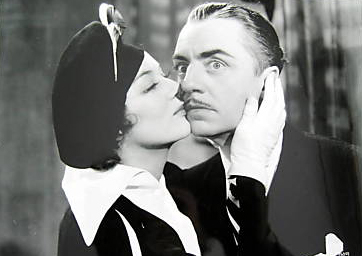 Of course, it pales in comparison with the chemistry Bill had with Myrna Loy (after all, they did star in 13 film together), but it is obvious Bill and Roz liked each other and enjoyed working with one another. Bill ended up being a longtime friend of hers and even attended her wedding six years later. I have always wished they made more films together, but we can’t have everything we want. They could have had more delightful fun together. This film takes place during World War I in the year 1917 when the United States entered the war. The film concerns a group of men whose job it is to crack the code coming from the enemy so they know what their next move is. The way the code is always written is with invisible ink on ordinary documents. William Powell plays William Gordon, a master at the task, who even wrote a book about enciphering and deciphering code. Soon after Bill is introduced onscreen, Roz appears and she plays Joel Carter, a young woman who spends a lot of her time helping with charities and participating in the women’s suffrage movement. She immediately wants a celebrated Russian singer who is attending the charity event which they are all attending. She wants him to sing at her bazaar and when a man points the singer out to her, she mistakenly thinks Bill is the man she wants. When he realizes what she wants, he plays along and even puts on a fake Russian accent. He says some bizarre things to her and kisses her up and down her arm, which makes her uncomfortable. It is in this very first scene that some of Rosalind’s comic abilities come together and surface. Oh, even if she isn’t doing all the talking, the audience notices her. It’s all in her facial expressions. More fun ensues as a friend of Joel’s convinces her to help her with the charity auction. The woman tells the participants that the person who bids the highest on a doll will be kissed by Joel. Joel is embarrassed to do this, but she goes along with it. Soon, she sees a man with a very cumbersome beard (meaning there is just nothing on his face but hair) bidding higher and higher. She starts to get nervous until she sees Bill bidding on her. She seems to enjoy this, but isn’t laughing when Bill suddenly stops bidding at the last minute and the bearded man wins. She gives him a quick peck on the cheek and tells Bill she didn’t think he was very funny. Also at the charity auction is Nick Nieterstein (played by Cesar Romero), a man who has been jilted by Joel several times already, but is determined to have a date with her. He is rather mysterious and we soon find out he is working for the enemy as he relays a code to a man in San Diego, who cleverly writes the code in invisible ink on a prescription medicine bottle, which is then sent on to Mexico, where a man hands it to some Germans who are hiding out in his basement. The next day, Bill spots Joel again, this time marching in a women’s suffrage march. He notices right away that she is holding a sign which reads “I sent my sons to war, I want the vote,” which clearly does not apply to her. He jokingly asks her if she has any grandchildren and she switches to a sign marked “I’m in the junior league, I want to vote.” Suddenly, police officers are trying to stop their march and one in particular gets into an altercation with Joel. He tries to take her sign from her and she resists him, trying to push him away. Bill tries to come to her rescue, but when he throws a punch, the cop avoids it and Joel gets it full in the eye. Later, she softens toward Bill and is enjoying his company, but has a date with Nieterstein. She tells him she can’t possibly break a date with him again, but after Bill persuades her to kiss him goodbye at the train station before he goes off to war, she changes her mind. She looks back at Nieterstein sitting alone in the restaurant and quips, “He isn’t a bad chap. I don’t know why I treat him this way.” However, when she gives Bill a few kisses goodbye, she watches a train go and yells out, “Your train is gone!” Bill quickly explains to her that a train is gone. She realizes he’s taken advantage of her and runs off. He chases her down and they spend the entire afternoon and evening together. He is ordered to work for the war department in Washington, D.C. so they can make use of his decoding skills. He is furious that he has to work at a desk because all he wanted to do was go to war in Europe. He eventually figures out that the Assistant Secretary of War has a niece named Joel Carter and this is when the tables are turned. In the beginning, Bill was chasing Joel all over town, but once this happens, he is so angry that he doesn’t want anything to do with her. So what does she do? She starts chasing him just like a puppy dog. She knows he loves her and simply will not give up. I liked seeing the woman chase the man for once and it was very amusing the scrapes she got him in over the course of the film. At one point, she puts sleeping pills in his coffee because he has stayed up all night trying to decipher a secret code. After drinking the coffee, he ingests some powder that keeps one awake. When Joel finds out what he’s done, she calls out for a stomach pump. He orders her off the premises because he thinks she is ruining his life. A very important scene in the comedy of this film is when an enemy spy named Olivia comes into the picture (played by the lovely Binnie Barnes, who 30 years later would make The Trouble with Angels and Where Angels Go… Trouble Follows! with Roz). Joel, not always the sharpest crayon in the box, does not realize that Bill is not in the least bit interested in Olivia. He only wants to try to get some information from her. However, she does a funny bit when she pretends to be a matron to help Olivia off with her clothes. There was no way she would allow Bill to do it himself, after all. All eyes are on Roz in this scene. Just watch the way she handles the clothing and the shoes as she takes each article from her. Also, the way she walks back and forth is just funny. She ends it all with a hilarious line to Bill, “She’s bow-legged.” After she brings Olivia some new clothes to try on (an absolutely hideous outfit Joel purposely picked out), Olivia says, “Lt. Gordon is charming, don’t you think so?” to which Joel replies, “Well, of course I only met him with my clothes on,” giving her a withering gaze. Joel, completely fueled by her jealousy of Olivia, gets herself into trouble by showing up at her hotel room. She is soon bound and gagged and Bill has to save her. He pushes her down as the room is riddled with bullets. Once the Department of Justice has saved them from harm, Joel crazily starts saying, “He hit me over the head with a hammer!” without realizing Bill saved her life. The film ends charmingly when once again, she is kissing Bill (now her husband) goodbye at the train station as he goes off to war for real this time. However, he is once again ordered to sit behind a desk. He stares at Joel knowingly and he starts chasing her through the station. The first time they did this, she was running away from his intentions; this time, it was just cute. This wasn’t exactly the comedy role Roz was known for, but she is rather adorable, charming, and her comic abilities are not to be missed.